Zebra are species of wild horse in the genus Eqqus that are best known for their black and white stripes. They are scientifically known as the Eqqus quagga (Plains zebra), the Eqqus zebra (Mountain zebra) and the Eqqus grevyi (Grevy's zebra). They are found in Kenya, Somalia and Ethiopia, and the Grevy's zebra and mountain zebra are endangered species. All zebras have a unique pattern of stripes,   and are generally social animals and are usually found in herds. 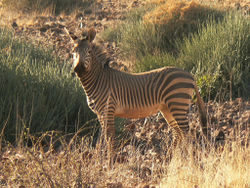 It is believed that the stripes serve as camouflage while in herds by confusing predators through motion dazzle, and that the unique patterns help to identify each other. Zebras reproduce sexually, and are born well developed. Newborns are so developed that they can hear and can walk or run almost run instantly after birth. They follow their dams (mothers) in the first few weeks of their life. The dam provides the newborn guidance and sustenance despite their independent appearance. The foal (newborn zebra) is capable of following the herd on its own with little guidance. After birth not all zebras stay in the same herd for life. The dam nurses the foal for up to a year and once they finish, the foal will leave the dam's side and join the rest of the herd. Once they reach about 22 months old they may choose themselves to leave the herd. After leaving their herd, the zebra finds other zebras that also left their herds of a similar age. When the zebra reaches the age of sexual maturity is when they fall into more solid herds. Male zebras usually reach sexual maturity at age three and a half years old but usually don't breed until they are around five years old. Female zebras reach sexual maturity between the ages of three and six. She will typically give birth once every three years and is reproductively active until her 24th year. Zebras can live up to 30 years in the wild, mainly because old age makes an easy target for predators. ↑ 1.0 1.1 Equus zebra zebra WikiSpecies. Web. Last Update 3 April 2009 Author Uknown. ↑ 2.0 2.1 2.2 Introductio to Zebras AfricaGuide. Web. Last accessed January 11 2015 Author Unknown. ↑ Zebra National Geographic. Web. Last access January 11, 2015 Author Unknown. 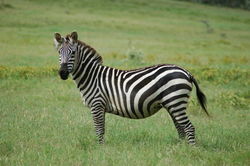 ↑ 4.0 4.1 Discover various interesting zebra facts Africa Wildlife Detective. Web. Last accessed January 11, 2015 Author Unknown. ↑ 8.0 8.1 Zebra Zoo Atlanta. Web. Last accessed January 11, 2015 Author Unknown. ↑ Foden, Simon. The Life Cycle of a Zebra After It Is Born Animals Pawntion. Web. Last accessed January 10, 2015 Author Unknown. This page was last modified on 14 February 2017, at 19:02.